ShopRite Weekly Ad February 10 - February 16, 2019. Happy Valentine's Day! 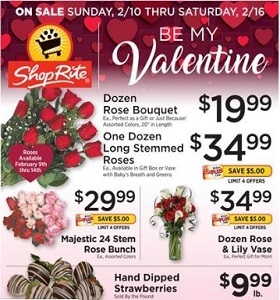 ShopRite Weekly Ad February 10 – February 16, 2019. Happy Valentine’s Day! -$2.99 Nestlé La Lechera Condensed Milk; 5/$3 ShopRite Beans. To see the weekly circular for your favorite ShopRite store, search by ZIP Code or city, state.